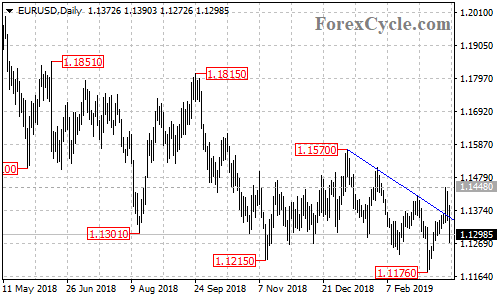 EURUSD broke above the falling trend line on the daily chart and is now in the uptrend from 1.1176, the pullback from 1.1448 is likely correction for the uptrend. Another rise could be expected after the correction, a breakout of 1.1448 resistance could trigger further upside movement towards 1.1700. On the downside, a breakdown below 1.1176 support would indicate that the pair remains in the downtrend from 1.1570, then further decline to 1.1000 area could be seen.